The conventional wisdom on and central paradox of Akira Kurosawa is that in the West he is Japanese film incarnate, while in Japan he's derided in some circles as overly Western. Kurosawa did nothing to parry that muted criticism; in fact, in his choice of material (Shakespeare, Gogol, Simenon), he almost seems to challenge his doubters to bring it on. 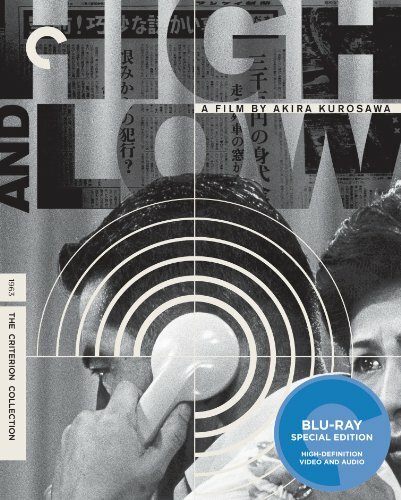 And that's nowhere more clear than in High and Low, which is based on a crime novel by Ed McBain—Kurosawa transposes the piece from a fictionalized Manhattan to Yokahama, and imbues it with his ongoing concerns about the ruthlessness at the heart of so much interaction, about the darkness that eclipses so much of the good in our world. But the morality is cloaked in the trappings of a police procedural, making for a fantastically noiry and deeply moral adventure. Toshiro Mifune, the director's leading man of choice early in their careers, gives his penultimate Kurosawa performance here as Kingo Gondo, corporate titan—it's a very restrained role for Mifune, especially if you know him as the kinetic center of pictures like Seven Samurai. The film opens like a conventional boardroom drama, in the manner of Executive Suite or Kurosawa's own The Bad Sleep Well, with the aesthetic Kennedy-era trappings so romanticized on Mad Men, as Gondo fights for control of National Shoes. He's committed to a quality product, to value for his customers; the young Turks at the firm simply want to push product and hold down costs, in the process turning out footwear of a deeply shoddy quality. Scampering through the meeting is Gondo's son and his playmate, the son of Gondo's chauffeur—a menacing phone call comes in that Jun, Gondo's boy, has been kidnapped, but soon it's clear that it's Shinichi, the manservant's child, who has been taken instead. Without giving away too much plot, the film plays off and upends this carefully cultivated visual style—by the end of the picture, this locked-down style has given way to chaos, mess, crowds, action obscured by crowds of strung-out junkies. (For a long time David Mamet was attached to a remake, and you can see the appeal—Mamet uses much the same structure in Oleanna.) Mifune disappears for much of the second part of the movie, but the cast is still full of familiar faces from Kurosawa's de facto stock company, including Tatuya Nakadai as the inspector in charge of the investigation, and Takashi Shimura as the chief of police. And as with Kurosawa's other contemporary pictures, this one gives us an insightful view of a society in transition, the curious combination of East and West—Gondo and his cronies wear business suits, for instance, but the women of their class wear only kimonos, and the fetishism of technology is a crucial portion of the film, too, with phone taps, high-speed trains, and high-resolution film, to name just a few. It just provides one more level of fascination for this deeply gripping work by one of the masters. And so the extras. As he has done for Kagemusha, Red Beard and Ran, Kurosawa scholar Stephen Prince provides the commentary track, which brims with observations about the evolution of the director's mature visual style, Kurosawa's take on literary adaptation, and no shortage of trivia about those on both sides of the camera, and their participation in other films in the director's body of work. It's a thorough and creditable track, and occasionally an exhausting one. Also on hand is the appropriate installment of Toho Studios' Akira Kurosawa: It Is Wonderful to Create (36m:59s), a film-by-film documentary series on the making of each of the director's pictures—this one features interviews with actors Tatsuya Nakadai and Kyoko Kagawa, and vintage footage of Kurosawa himself. Perhaps the most intriguing extra is a 1981 Japanese television interview (30m:29s) of Mifune—he's plugging the release of the miniseries Shogun, and the frequently reclusive actor sits through a half hour on what looks like the Japanese equivalent of Dinah Shore's old talk show. And in a new interview (19m:02s), Tsutomu Yamazaki, who plays the kidnapper, talks about auditioning for the director, and his initiation into the Kurosawa stock company. One of the two original trailers features footage from a final scene, later cut; and the accompanying booklet offers illuminating essays by Geoffrey O'Brien (on Kurosawa and adaptation) and Donald Richie (reporting from the set).